This one-layer strawberry cake is topped with a delicious strawberry cream cheese frosting for a fabulous spring or summertime dessert. The strawberries will give a natural pink color to the frosting and the cake. This simple cake is the perfect dessert for a family meal or taking to a gathering. Fresh strawberries are in season in late spring and early summer. If you are used to imported year-round strawberries at the supermarket, which are picked green, you'll be blown away by the flavor of vine-ripened strawberries. Seek them out at a farmers market or a U-pick farm. Better yet, you can easily grow strawberries in containers or in your garden, and even choose ever-bearing varieties that have fruit all summer long. Be aware that fresh, ripe strawberries are quick to spoil and mold, so buy only as much as you can use over the next two days. But another good choice, for convenience, is buying frozen strawberries, especially in this recipe where they are mashed rather than used whole or sliced. Simply allow the berries to thaw before using them. Frozen berries often are far more flavorful than fresh non-local strawberries. 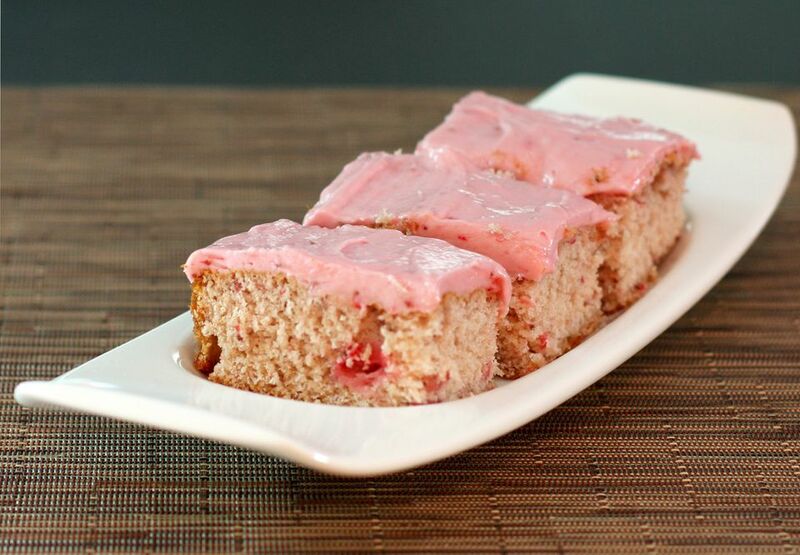 Note: while there are multiple steps to this recipe, this strawberry cake recipe is broken down into workable categories to help you better plan for preparation and cooking. Heat oven to 375 F. Grease and flour a 13-by-9-inch baking pan. Combine the flour, salt, and baking powder; set aside. In a mixing bowl with electric mixer, cream butter and 1 1/3 cups of sugar until light and fluffy. Beat in eggs, one at a time, beating well after each addition. Add the vanilla and blend well. Slowly beat about 1/3 of the flour mixture into the creamed mixture with half of the strawberries. Beat in another 1/3 of the flour mixture and the remaining strawberries. Blend in the remaining flour mixture and beat until smooth. Spread in the baking pan and bake for 25 to 30 minutes, or until cake springs back when lightly touched with a finger. Cool on a rack. Beat in the salt, 3 cups of confectioners' sugar, and strawberries. Add more confectioners' sugar, as needed, until thick enough to spread. Frost the cake with the icing. Store the cake in the refrigerator until serving time. Store leftover cake, covered, in the refrigerator. Because of the cream cheese frosting, it should not be left out at room temperature. You can serve it with more sliced strawberries on the side if you have lots of berries and want to enjoy them while they are ripe. If you bought too many fresh strawberries, freeze them whole or sliced to use for future recipes.